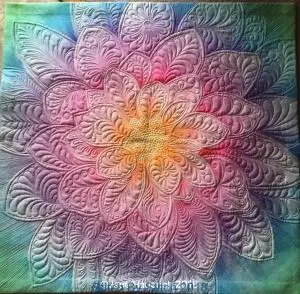 Learn the basics of free motion and join us on an adventure of learning many methods and designs that can be used in your quilts, wall-hangings and accessories. Beginners welcome, this process takes practice and is an ongoing class, jump in anytime! In February we will be focusing on the Dream Big Panel as a blank slate. Learn how to "audition " stitch designs with a few simple tools to highlight this gorgeous panel. Learn how to stitch simple feathers, too! We'll be practicing on the same supplies as on the supply list, the Dream Big panel will be an addition purchase and you will receive 10% discount an anything the day of your class.